Passed away peacefully 6 April 2019. Husband of Phyllis (dec), loving father of Carol (dec) and Gary. Father-in-law to Steve and Rhonda. Adored Pop to Vikki, Robert, Kristy, Luke and Lauren. 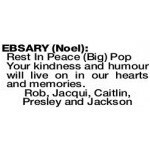 Big Pop to Caitlin, Presley, Jackson, Ryan, Kiani and Zoe. 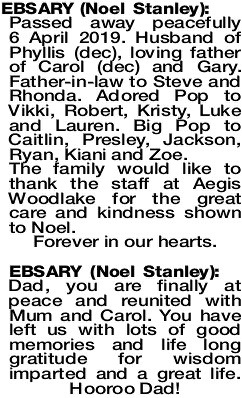 The family would like to thank the staff at Aegis Woodlake for the great care and kindness shown to Noel. Dad, you are finally at peace and reunited with Mum and Carol. You have left us with lots of good memories and life long gratitude for wisdom imparted and a great life. Hooroo Dad! 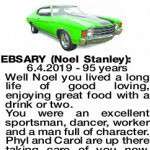 The Funeral Cortege for Mr Noel Stanley Ebsary formerly of Palmyra will arrive at PINNAROO Valley Memorial Park East Chapel for a Cremation Service on WEDNESDAY (17.4.2019) commencing at 2.30pm. 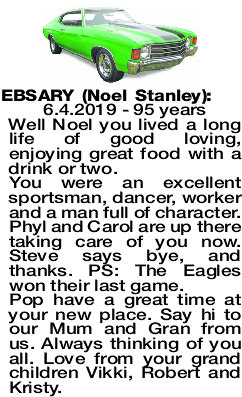 6.4.2019 - 95 years Well Noel you lived a long life of good loving, enjoying great food with a drink or two. You were an excellent sportsman, dancer, worker and a man full of character. Phyl and Carol are up there taking care of you now. Steve says bye, and thanks. PS: The Eagles won their last game. Pop have a great time at your new place. Say hi to our Mum and Gran from us. Always thinking of you all. Love from your grand children Vikki, Robert and Kristy. Your kindness and humour will live on in our hearts and memories.